Working Service Dog Blog: What is a Migraine Alert Dog? A migraine alert dog is trained to pick up the signals that a migraine is headed your way. By alerting you to this oncoming migraine, this medical alert dog will help you to be prepared to deal with it before the crippling pain starts. Fitted with a small service dog vest, a migraine service dog can accompany you in public to make sure that you're always prepared. - relax in a migraine-ready room with no light or sound. Migraines are more than just severe headaches and migraine service dogs can help you cope with the other symptoms as well. If you experience vertigo with your migraines, a medical service dog could help support and stabilize you while guiding you to safety. Service dogs for migraine alert require a different kind of training from other medical alert dogs. Migraine alert dogs learn your body's specific signals, which means that the more time you spend with your dog, the better that it will be able to assist you. As the dog begins to learn more about your body from daily interaction with you, it will be able to sense a change and offer a warning. Migraine alert dogs can tell that a migraine is on the way by sniffing your breath and sensing your aura. While any size dog can be a medical alert dog, small dogs are often better as they have an easier time getting close to you. 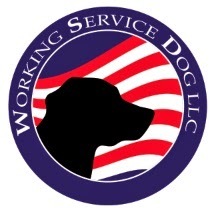 Although not required by ADA, certain types of service dog certifications can provide your dog with service dog status, saying that it can accompany you anywhere that a service dog is allowed in public. 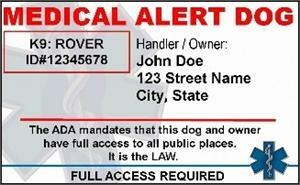 As long as your symptoms qualify under the ADA, a migraine alert dog can accompany the handler in public. If you are training your service dog to be a migraine alert dog, be sure to fit your medical alert dog with a service dog in training vest to alert the public to your working dog. If you suffer from migraines, a service dog vest and certification are both helpful to ensuring that your service dog is able to help you at all times.